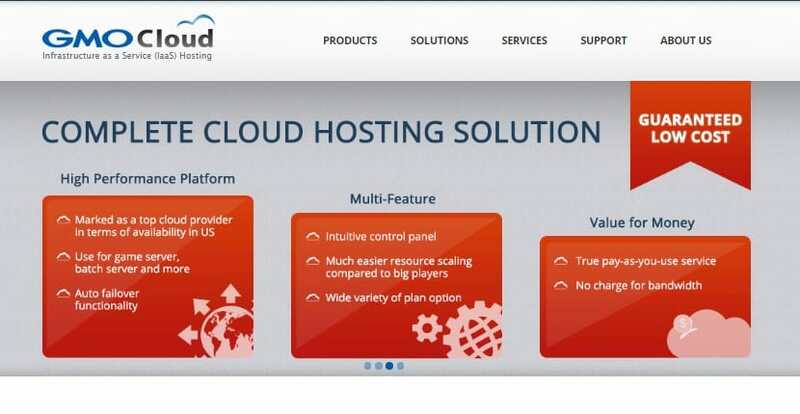 GMO Cloud America Review 2019: Is GMO Cloud America a Good Hosting? GMO Cloud America Inc. has been providing web hosting solutions to users in America, Japan, and other countries around the globe for more than 15 years. The vendor presents itself as the most affordable web cloud hosting solutions vendor offering value for your money by only charging you for the resources you use. GMO Cloud America Inc. is an affordable web hosting provider based in the United States and with data centers in the U.S., Japan, and Malaysia. This multi-feature website hosting provider is committed to delivering a high-performance hosting platform loaded with everything you would need to build and manage your websites. GMO Cloud America Inc. has been in the hosting business for over 15 years and its website is available in English and Japanese. Pre-configuration for instant activation – pre-configures servers make it extremely easy to get started as soon as the company sets you up. They use both Windows and Linux operating systems so that you can use the one you prefer. Load balancers – designed to build fault tolerance within your network and ensure that the load is spread across available resources. Cloud management tools – all their hosting plans include a Customer Portal designed to help you manage your cloud resources with ease as well as automate operations using the company’s API. High availability – their service offerings are designed around their powerful data centers located in various locations the world over including San Jose in the U.S. and Tokyo in Japan. These data centers make it possible to assure customers of high network uptime. Secure platform – safeguards clients’ data and prevents interruptions. GMO Cloud America Inc. presents as the most affordable web cloud hosting solutions vendor in Japan and beyond. The company is dedicated to offering value for your money by ensuring that you only pay for what you use. GMO Cloud customers hosting costs are calculated on an hourly basis so that you pay less for the hours your use of resources is at the lowest. All the same, you can also choose its fixed plans and pay per month. The process of switching from one plan to another is extremely easy and straightforward. GMO Cloud gives its customers the freedom to downgrade or upgrade their plan anytime. It does not charge any fees to transfer your websites from your former host neither does it charge any setup fees. What’s more, all its plans provide customers with free load balancing functionality. GMO Cloud America Inc. offers no money back guarantee. There is no free trial version or a free version of any of their cloud hosting plans. GMO Cloud America Inc. has a dedicated support portal for that guides their customers through the whole process of setting up, managing, and making the most of its cloud hosting platform. The portal includes manuals that introduce beginners into the world of cloud computing as well as all the documentation necessary to help you use the features the vendor has made available. In the event that the information here is insufficient or unclear, you can contact the GMO Cloud support team via the phone numbers available on its website or by email. There is no live chat. When I sent an email to the company’s support team, it did not take very long to get a response. In the response email, I felt that the team went above and beyond to address my concerns in a satisfactory manner. GMO Cloud is the premier web hosting solutions provider in Japan and other countries around the globe. With pay-as-you-go and fixed monthly plans for customers to choose from, you can customize your solution to your particular web hosting needs. Wondering how GMO Cloud America stacks up against other Web Hosting companies? Enter any other Web Hosting company and we will give you a side-by-side comparison.